Do you want to build your visibility on LinkedIn? Wondering which LinkedIn features can help? LinkedIn can help you build a professional presence that showcases your work to the people you most want to connect with. 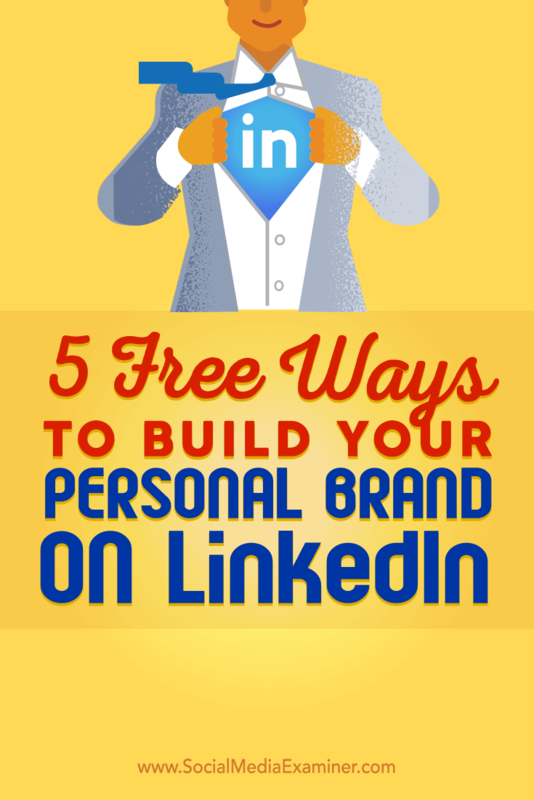 In this article, you’ll discover five free ways to help you build a personal brand on LinkedIn. Discover five free ways to build your personal brand on LinkedIn. Your profile is the key component of your experience on LinkedIn. A complete profile shows you’re actively participating in the LinkedIn ecosystem. Did you know that you can make your profile seven times more likely to be found in searches by adding a profile photo? Or that you can make your profile twelve times more likely to be found by showing your two most recent employment positions? To start, add a professional profile picture. Your picture is your virtual handshake, so pick a friendly profile picture that aligns with your role. Use a photo that’s friendly, professional, and approachable. Choose a square profile picture, recommended at 400 x 400 pixels, and stay under 10 MB in file size. If either width or height exceeds 20,000 pixels, your photo will not upload. Next, create a distinctive LinkedIn profile headline. By default, the headline is your current employment position; however, you can customize it to demonstrate your expertise or vision for your role. Think of your headline as your brand’s tagline. It’s the first description many people will see, so make it count! In addition, use your LinkedIn background to communicate more about who you are and what you do. Think about blank billboards along the highway. Those are missed opportunities. The same could be said for your LinkedIn background photo (the photo that displays above your name and headline). Many LinkedIn members use stock photos, nature snapshots, or city skylines for the background image. However, you can use that space to do much more than show off your hometown. Robert Rose puts content front and center in his background image, showcasing highlights from his content library. Use the background space for content stream promotions, miniature portfolios, credibility-building, publications, photos of you influencing others, and more. Identify your personal brand by using a photo to express an interest secondary to your résumé, but which points to your personal life or work ethic. Next, customize your LinkedIn URL and share it everywhere. For personal branding, attach everything on the web to your full name, and climb as high as you can in the search rankings. LinkedIn’s vanity URLs can help you do just that. As a major website, LinkedIn has a high Google PageRank. Using a URL like this, linkedin.com/in/yourfullname, means you’ll likely see your name rank pretty high, too. To climb in search rankings, customize your URL. Tip: Add your personalized link to all other social streams, like your blog, email signature, online résumé, Twitter, Facebook, and LinkedIn SlideShare. Finally, tell your story using the Summary and Experience sections. Your LinkedIn profile should be more than a quick copy-and-paste of your résumé. The Summary is where you can share a bit more about your vision for your role or company. You can also include personal anecdotes about activities you enjoy outside work. 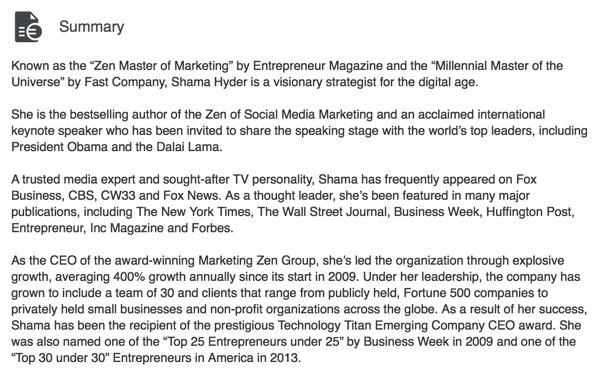 Shama Hyder, CEO of the Marketing Zen Group, makes her profile come to life by featuring published content and a keyword-rich summary. Your Experience section should include a tidy list of the key positions you’ve held, and briefly explain your roles. You can also detail your educational background. Uploading rich media (videos, images, and presentations) and content you’ve created or produced as part of a team is a great way to bring your description to life. Tips: Use a keyword-rich approach that makes your profile easier to find. Take out overused words like motivated, passionate, responsible, creative, and driven. And add multimedia content to your profile from written posts on LinkedIn Publisher. Once your profile is impeccably optimized, you’ll be ready to grow your network and build your strategic brand associations on LinkedIn. This keeps your network fresh and active, and strengthens your global connections. 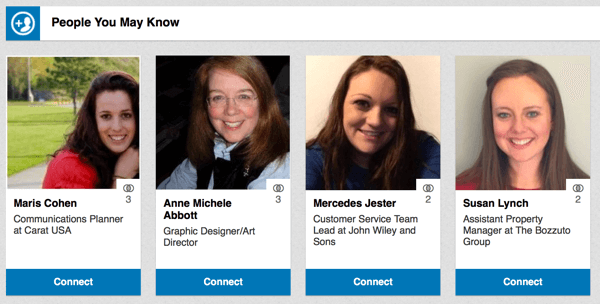 For people you know, have met, or are about to meet, LinkedIn gives you even more information about them. People generally think highly of those who keep good company, so building your LinkedIn network simultaneously builds your personal brand. To do this, connect on LinkedIn with trusted friends, former colleagues, classmates, industry leaders, vendors, and other professionals. And don’t be shy about asking your contacts for introductions to people in their networks. Go to My Network > People You May Know to start growing your quality network. Tip: If you’re trying to connect with someone you don’t know, include a personal note explaining why you’d like to connect. For example, “I saw you speak at X conference and was blown away by the ideas you shared.” Then that person may be more likely to accept your request. We live in a feed-driven world. Americans now engage with seven different sources of information every day through multiple channels. According to Entrepreneur, Millennials spend 18 hours a day consuming media. Today, LinkedIn is the definitive professional publishing platform. In fact, more than 1 million people have published more than 3 million posts on LinkedIn. As for Millennials, they represent nearly 30% of all long-form publishers on LinkedIn. Publish content on LinkedIn to showcase thought leadership, of course, and show the world what you care about. Once you begin to publish on the LinkedIn Publisher platform, you’ll quickly see a spike in your profile views. 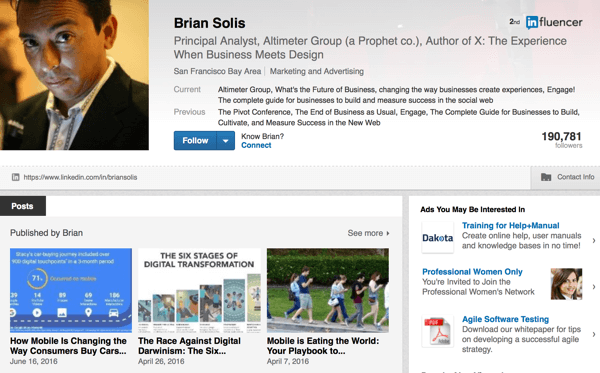 LinkedIn influencer Brian Solis generates awareness, establishes thought leadership, and drives targeted website traffic by publishing content on LinkedIn. Publishing long-form content on LinkedIn is a great way to reach an engaged audience and build your personal brand. The more long-form posts you publish, the more credibility you’ll build, and the stronger your professional profile will become. Although Millennial leaders vary in age and experience, they have one thing in common: a desire to learn. Through LinkedIn, you can invest in yourself and your lifelong education. Design a feed that keeps you in the know. Simply follow the people and topics that matter most to you and unfollow those that don’t. In three steps, here’s how to find useful resources. First, tap on the control menu (three dots) in the top-right corner of any update in your feed. On the mobile app, click the three dots in the upper-right corner of a profile. Next, tap on the option that says Improve Your Experience. Make adjustments by choosing Improve Your Experience. 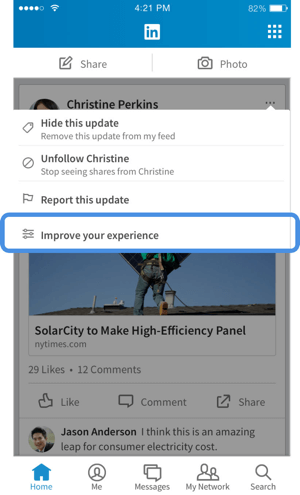 Now, you have the option to choose from personalized recommendations for people, publishers, and topics to follow, tailored to you based on your LinkedIn profile. 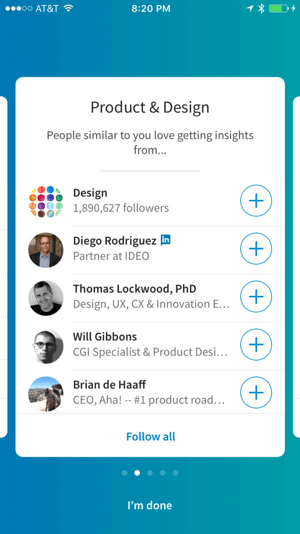 LinkedIn makes suggestions based on professionals similar to you. 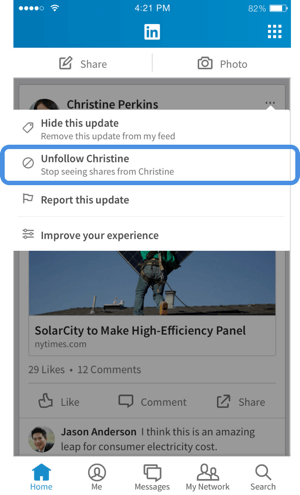 Following the news and insights that matter to you is a great first step, but you can also further streamline your feed by unfollowing connections whose updates you don’t need or want to see. They won’t know that you unfollowed them and you’ll stay connected. First, when you find an update from a connection that you don’t need or want in your feed, tap on the control menu (three dots) in the top-right corner. Then, tap on the option that says Unfollow (insert connection name). You can streamline your feed by unfollowing connections. Tip: LinkedIn adapts, so use it purposefully. A variety of activity signals determine what appears in your feed. The more you follow, consume, and share topical content, fill out your profile with information about your career, and take other actions to engage meaningfully with the LinkedIn platform, the better the content matches become. Follow LinkedIn influencers to keep abreast of insights from top industry leaders. 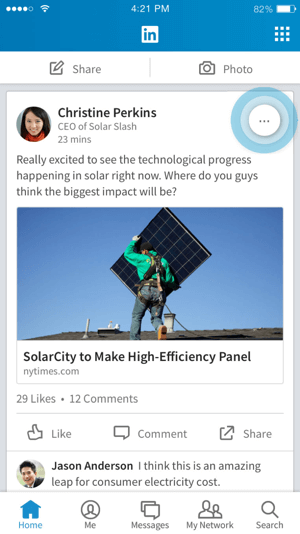 Another way to do this is to use the LinkedIn Pulse news app. 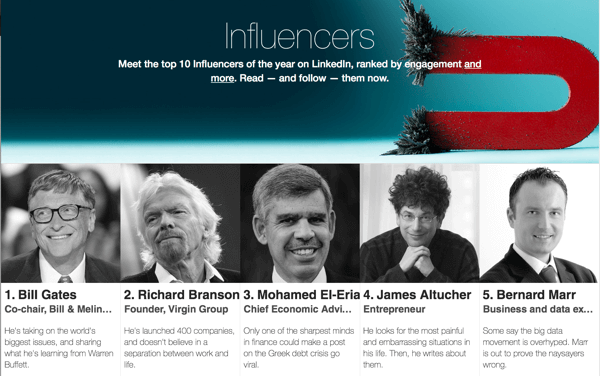 Here are the top 10 influencers of 2015 on LinkedIn, ranked by engagement and determined by those who are most widely read. These are the top LinkedIn influencers of the year. With more than 400,000 new pieces of content added each month, SlideShare is the world’s largest professional content-sharing community. On an average day, nearly 4 million people visit LinkedIn SlideShare. That’s just on desktop. Can you really afford to overlook that number of eyeballs? In addition, Google indexes every presentation on LinkedIn SlideShare. And because more than 80% of the traffic to LinkedIn SlideShare comes from organic search, your presentations can give your brand an SEO advantage. Build authority by presenting LinkedIn SlideShares from a unique point of view on your industry’s trends or news. You can also share your presentations, videos you produced, webinar videos you’re featured in, and nicely designed content you created. 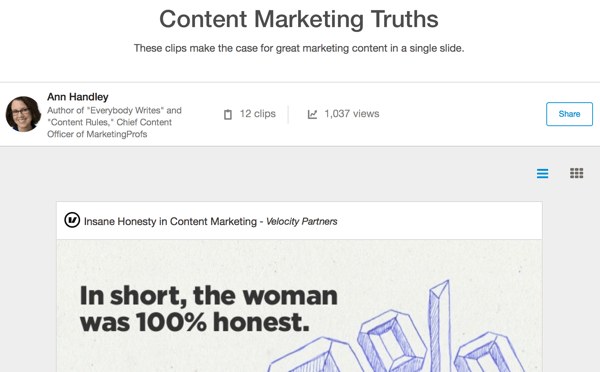 Using the clipping tool, Ann Handley created a LinkedIn SlideShare page called Content Marketing Truths. Tip: Leverage the clipping tool in SlideShare, which highlights some of the most valuable content you’ve produced. Also add SlideShare presentations to your LinkedIn profile to boost your personal brand. Today’s top-performing professionals are social professionals. When you join LinkedIn, you’re joining a network looking to engage, interact, and swap ideas. You’re not just joining a social network; you’re joining a community of sophisticated professionals who are simultaneously providing value and seeking news and innovations. Once you begin building your brand on LinkedIn, you’ll be surprised at the number of opportunities that come knocking on your door. If you’re not on LinkedIn, you’re reducing your chances of being discovered. On LinkedIn, you can also stay up to speed on industry news. Whether you care about marketing, sales, fashion, education, or medicine, LinkedIn is a great place for sharing and publishing professional content. Adapt the tips and best practices found here, and you’ll be well on your way to connecting with other engaged professionals looking to interact and swap ideas. What do you think? Are you using these LinkedIn tactics to elevate your personal brand? Have your efforts been successful? What tips do you have to share? Please share your thoughts in the comments below! 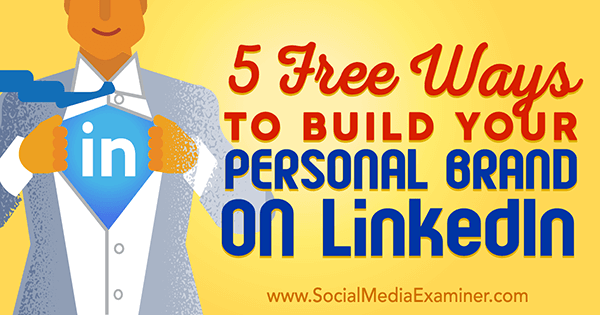 Tips on five free ways to help you build your personal LinkedIn brand. Alex manages social strategy for LinkedIn Marketing Solutions, bringing the brand voice to life across social and the LinkedIn Marketing Solutions blog through content designed to inspire marketers to succeed.